Finally, the 969-MW Neelum-Jhelum Hydroelectric Project (NJHEP), which is one of the largest public sector power projects in Pakistan, has begun supplying electricity to the national grid. The run-of-the-river project located in the picturesque Neelum Valley of Azad Jammu and Kashmir, 200 kilometres northeast of Islamabad, has been built by a Chinese company. Amazingly, 90 per cent of 68 kilometre long tunnels have been constructed underground in the mountainous region which is considered a wonder of engineering. some unresolved issues still pester the AJK government and people. 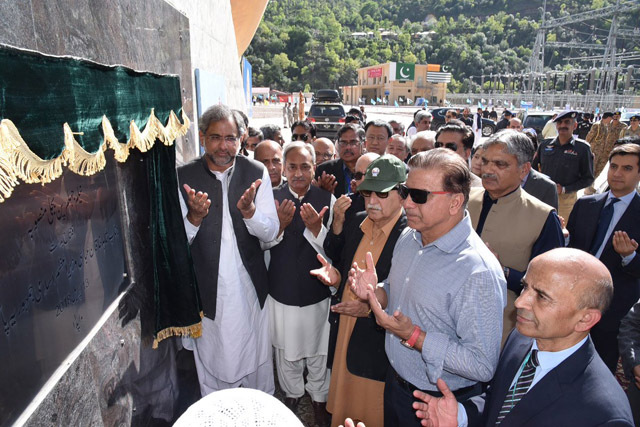 At the inaugural ceremony, AJK Prime Minister Raja Farooq Haider Khan raised several pertinent issues related to the Neelum-Jhelum project as well as longstanding issues between the governments of Pakistan and AJK. He politely reminded Prime Minister Shahid Khaqan Abbasi that no formal agreement has so far been signed between the governments of Pakistan and Azad Kashmir about the water usage charges of this project. AJK, home to several hydropower projects, is being treated as a rural area and faces long power cuts nowadays while other major cities of Pakistan are having comparatively much lesser shortage of electricity, he mentioned with a heavy heart. The AJK government has been begging for 250 MW electricity since long but authorities do not pay heed to this demand. The AJK’s prime minister also highlighted the need for an exclusive power transmission line to ensure uninterrupted supply of electricity. Tariq Naqash, a senior journalist based in Muzaffarabad, told TNS that the prime minister of Pakistan conveniently ignored these demands and did not even bother to mention them in his speech. Besides Neelum-Jhelum, a number of hydropower projects are being constructed in the region such as the 102-MW Golpur and the 48-MW Jagran II, 75 MW projects at Nagdar and Dawarian while 148-MW Patrind Project was completed last year. The government authorities are expecting that within next ten years, the Karot, Kohala, Mahl, Azad Pattan and Dudniyal power projects would generate five to six thousand mega watt. The massive projects of hydropower generation significantly enhanced the importance of AJK as well as local citizens’ level of expectations. The region is home to five universities, three medical colleges, two cadet colleges and dozens of other technical centres. Several surveys have established the fact that AJK is ranked among the top regions in female education and stands out in the literacy rate at the national level. Besides, millions of local inhabitants are politically, socially and economically playing a vital role in the United Kingdom and several other major countries. Interestingly, most of them are intimately connected with their families back home and are a major source of remittances which is considered a backbone of the local economy. In this context, local people and young political leaders are quite sensitive about the utilisation of their natural resources, protection of the environment and direct dividends of these projects. Nowadays, people are bluntly criticising the inability of successive AJK governments to actively pitch their case before Islamabad, and compel it to sign and implement a well-formulated agreement on the Neelum-Jhelum project. Back in 1967, WAPDA had constructed Mangla Dam and subsequently in 2003 its level was raised. On both the occasions, proper agreements were signed between Islamabad and Muzaffarabad which highlighted the responsibilities and obligations of both the governments. Despite repeated requests and even protests, WAPDA is not able to strike an agreement with the AJK government. Sources say that WAPDA is not willing to pay net hydel profit/water use charges at par with the Khyber Pakhtunkhwa and Punjab to AJK which is currently Rs1.10 per unit and increases periodically. At present, it pays only 42 paisa per unit to AJK as water usage charges of Mangla Dam which is considered peanuts, constituting less than Rs1300 million per year till now. The AJK authorities confided that WAPDA is far from fulfilling its other promises too. It was initially stated that WAPDA would complete the construction of water supply schemes, recreational parks, basic health units, bridges, water treatment schemes and watershed management besides making sure that Muzaffarabad city gets an uninterrupted and clean water supply. All these promises are yet to be fulfilled. To mitigate the environmental hazards, it was agreed that a few water bodies would be built in order to store water which would be released in the dry season. Sadly, no construction work has been started to develop water bodies. Likewise, out of the 153 km long 500kv double circuit transmission line, 100 km runs through thickly populated areas of AJK. Local community representatives often complain that neither proper compensation was paid to them for their land nor people were educated how to safeguard themselves from the hazards associated with the high-power transmission line. Initially, it was expected that WAPDA would provide jobs to locals once the projects start but the local civil society actors told TNS that WAPDA has transferred its employees from Punjab and Khyber Pakhtunkhwa to AJK to work on these projects instead of giving jobs to locals. It has created discontent among the local youth and political representatives alike. The unemployment rate of AJK is higher than other provinces of Pakistan. International Labour Organisation maintains that youth unemployment rate of AJK is around 18.44 per cent which is unprecedented. There was an expectation that local youth might get employment in this project. The inauguration of Neelum Jhelum project may usher a new chapter of economic revival in the country. However, its dividends should trickle down to the local inhabitants. In this regard, all outstanding issues must be resolved on the basis of justice and parity so that local community could become a partner in the journey of growth and development instead of an irritant preventing peace and prosperity in the region. A joint mechanism, comprising WAPDA and AJK’s authorities, should be formulated as early as possible to make sure that both sides fulfill their obligations and responsibilities according to the promises.